Jim Rutherford inherited a Penguins roster that still had much of the talent from the back-to-back trips to the Stanley Cup Finals but had seen the supporting cast slowly deteriorate over the five years since then. When free agency opened Rutherford move quickly, adding Steve Downie, Blake Comeau, and re-signing Marcel Goc to help fortify the bottom six while adding a very good backup goaltender in Thomas Greiss and a great defenseman on a cap friendly deal in Christian Ehrhoff. These moves come in addition to his draft day trade, where he sent James Neal to Nashville in exchange for Patric Hornqvist and Nick Spaling. While the bottom six looks to be much improved this season, there are still questions left to be answered in a top six that is dealing with an unusual amount of uncertainty. - While Pascal Dupuis has been a fixture next to Sidney Crosby since Bill Guerin retired, his ACL surgery and rehab leave it unclear how close he'll be able to return to 100%, especially at the start of the season. As Dave Molinari reports, Dupuis has not yet been cleared for contact and is uncertain whether that next step will come in time for training camp. Adding to the uncertainty is his performance last season before getting injured. After posting career years in each of the previous two seasons, Dupuis took a step back last year as his goal, assist, and point totals fell back in line with his career norms. While Dupuis is better suited than most 35 year olds to come back from a serious knee injury due to his rigorous conditioning, if his play last season was a sign of age catching up to him then he might be better suited for a role on the 3rd line. - While Sidney Crosby has a potential question mark on his right wing, Evgeni Malkin has a potential question mark on his left wing as the team must replace Jussi Jokinen, who turned in a big offensive season last year (21g, 36a) then cashed in during free agency with the Florida Panthers. Beau Bennett enters the season first in line, although like Dupuis he is also coming off surgery and might not be ready for the start of training camp. Bennett's health will be a big concern as he's had trouble staying on the ice since the Pens selected him in the 1st round in 2010, whether at the University of Denver or professionally. The time lost to injury is especially problematic given that Bennett was drafted as a long term project, but he has flashed the skill set that would cement his spot in the top 6 if he could tie up all the loose ends and stay on the ice. He had a decent rookie season as a mid-year call-up in 2013 (3g, 11a in 26gms) before hitting a sophomore slump last season (3g, 4a in 21gms) as injuries and inconsistent play took their toll. Regardless, the Penguins will need Bennett to take a big step forward in his development this year as few other players are viable top six options. - Outside of Dupuis and Bennett, there's little top six depth within the organization to replace them if either struggles or gets injured again. Kasperi Kapanen is the most talented option, and he was the top ranked European skater in the last draft, but it's not likely that he'd be able to make it in the NHL next season as an 18 year old, let alone playing well enough to merit time in the top six. Steve Downie had the best years of his career playing for Rick Tocchet in Tampa Bay, but he hasn't been anywhere near as productive since being traded in 2012 and it's questionable whether he could reach that level again. If the team needs to look any deeper in the organization for a winger to play in the top six it's likely to be little more than a shot in the dark. This isn't the first time in recent memory the Penguins have entered the season with uncertainty in the top half of the lineup. - Crosby and Malkin are generational talents, but it only takes a look back two seasons to see the affect weak linemates could have on their games. While the Penguins iced a line with the reigning MVP and the 1st team All Star at RW from the season before, the LW spot on the line was up for grabs between the likes of Eric Tangradi, Tyler Kennedy, and Dustin Jeffrey. In an act of desperation, the team claimed Zach Boychuk off waivers from Carolina during the season in an attempt to solidify the position to no avail. 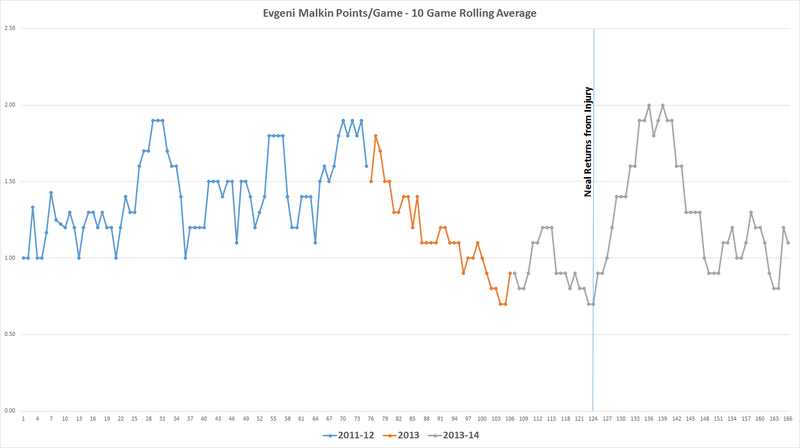 The below graph shows Evgeni Malkin's 10 game rolling pts/gm average over the past three seasons. Malkin averaged an incredible 1.45 pts/gm during the 2011-12 season, followed that up with the second-worst pts/gm of his career (1.06) in 2013, then rebounded to 1.20 pts/gm last season, just shy of his career average (1.22). 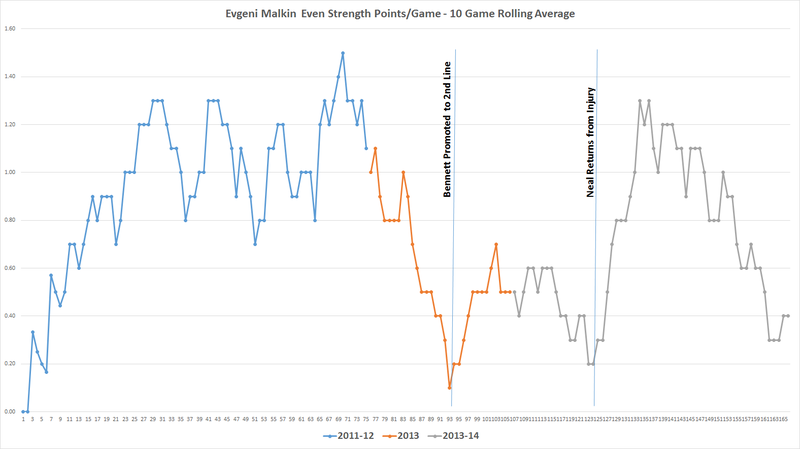 A clear trend can be seen as his rolling average continued to drop over the course of the 2013 season, but a breakdown of Malkin's scoring at even strength and on the power play shows how big of an effect his LW had on him in 2013. Even more noticeable is the split between even strength and power play production. 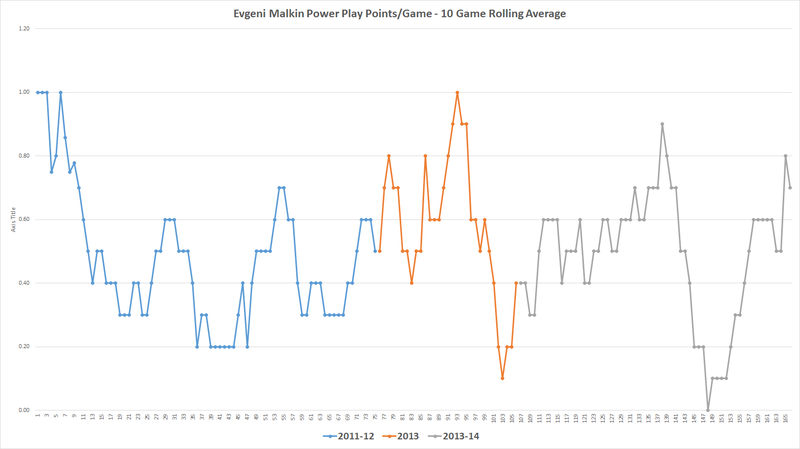 As can be seen below, Malkin posted some of his best numbers on the power play in 2013, finishing with 0.58 PP pts/gm on the season as compared to 0.45 PP pts/gm in 2011-12 and 0.50 PP pts/gm last season. Even with the late season slide his 2013 power play numbers topped those from the other two years, which underscores the fact that the issues present were five on five. His even strength scoring rate plummets in 2013 from where it was the season before even though he was scoring even more proficiently on the power play. This decline stabilizes itself when Bennett (and later Iginla) are inserted onto his left wing. A similar effect can be seen last season as well, as Neal's return from injury again boosts Malkin's production before tailing off at the end of the year as part of a team wide slump. While it's not likely the Penguins will experience Tangradi/Boychuk levels of play in the top 6, it is important that the wingers are pulling their own weight and not dragging down their linemates. Crosby and Malkin will produce at a high level regardless, but the difference between a bad winger and an average winger, or an average winger and a good winger, is noticeable. Mike Johnston shouldn't hesitate to switch things up in the early going as he tries to find the right line combination and forwards to complement his star centers. - To put things simply, Patric Hornqvist and James Neal are different players. Hornqvist is engaged at both ends of the ice and will provide a net front presence the Pens have been lacking, while James Neal has an elite shot and an elite ability to find open space on the ice. Both are capable of putting the puck into the back of the net, but while many fans might think that Hornqvist will get the same scoring bump playing with Malkin that Neal saw, it's unlikely to be that simple. Neal was a more productive scorer with Dallas (0.34 goals/gm) than Hornqvist was with Nashville (0.29 goals/gm), and it should be noted that a 22-year-old Neal joined the Penguins before reaching his prime while Hornqvist, at 27 years old, is already there. Malkin and Neal almost instantaneously developed chemistry together that will be difficult, if not impossible, to match. Part of the reason Jarome Iginla didn't develop into a good fit in Pittsburgh was because he had lost a step or two over the course of his career, and Hornqvist isn't known for strong skating. In fact, he was left off Sweden's roster in Sochi because of his lack of speed. This isn't to suggest that Hornqvist and Malkin will be a bad fit together. They're both incredibly talented players who will find a way to make things work. Not to mention that Hornqvist being less of a pure shooter than Neal, and much more willing to battle around the net, will likely force Malkin to keep the puck on his stick more, and very few players across the league are more dangerous with the puck than Evgeni Malkin. While they look like a good match on paper, it's likely that the two will experience growing pains as they try to adapt to each other's game. - In a worst case scenario, one where the uncertainties listed above all take a turn for the worse, Johnston does have another option that he can turn to. Brandon Sutter has posted mediocre scoring numbers and bad possession numbers since coming over to the Penguins from Carolina, although questions about the talent of his linemates have clouded the picture a bit. He got a chance to play some minutes in the top six last postseason with Bylsma stacking the top line with Crosby and Malkin, and Sutter responded by posting 5g and 2a in 13 games. It's a small sample size, and while there are reasons to believe his production wouldn't be sustainable (17.9 shooting percentage, 104.1 PDO, negative corsi), there's enough in that small sample of games to suggest Sutter as the 2C could be a viable option. He posted a CF% of 49.3, and while that's a little bit below average it's still better than the 43.5 and 42.5 CF% that he posted the past two regular seasons. His rel CF% (-7.9) would suggest that he wasn't playing a better possession game but rather was being pulled up by his better linemates. However, it's worth noting that Sutter faced the second hardest QoC (1.438) while also receiving some of the most difficult zone starts (40.2 OZ%).